Infusion expert Patti Bales, R.N., made a treatment plan for Ronald Phillips that allowed him to stay at home. Ronald Phillips, 74, of Vacaville, found an ally at NorthBay Wound Care, Hyperbarics & Infusion Therapy who helped him leave a skilled nursing facility to return home for the lengthy treatment he required. His road to a cure had been long and painful.Ronald was fighting an infection that sent him from feeling “so cold his bones rattled” to suffering from the heat of a 104 degree fever. Tests revealed he had a bacterial infection in a heart valve and around a pacemaker lead in his heart. After six days in the hospital, he still required a long course of antibiotics to cure the infection. He needed infusion therapy, which involves the administration of medication through a needle or catheter. It is prescribed when a patient’s condition is so severe that it cannot be treated effectively by oral medications. At the end of his hospital stay, Ronald was transferred to a local skilled nursing facility to complete his treatment. But it didn’t take him long to realize that he was not where he belonged. He wanted to be home with his wife of 47 years, Ingrid. Ronald Phillips was able to go home since he could receive his long course of antibiotics as an outpatient from the infusion center in Vacaville. Infectious disease specialist Dr. Gregory Warner had taken over Ronald’s care while he was in the hospital. And he offered the perfect solutiona—Ronald could go home if he could get his antibiotics as an outpatient from the infusion center in Vacaville. It was just blocks from Ronald’s home. Dr. Warner referred him to expert infusion nurse Patti Bales, R.N. Patti and her team of infusion nurses, Flo Brown, R.N., and N’Shana Steward, R.N., devised a plan that would provide Ronald with infused antibiotics for an hour and a half a day, seven days a week. His course of treatment would take eight weeks. Ronald started the very next day. “I was so thankful to get discharged from the nursing facility,” Ronald said. “The nurses at the infusion center took great care of me and everyone always had a smile on their face and the time to say hello.” Since he lives right down the street from the infusion center, the daily trip became an easy routine. Now totally recovered from his ordeal, Ronald is resuming his passion for fishing and hunting alongside his son, who is a Northern California wildlife biologist. NorthBay Wound Care, Hyperbarics and Infusion Therapy, located on the NorthBay VacaValley Hospital campus in Vacaville, offers a wide range of infusion therapies. Infusion therapy involves the administration of medication through a needle or catheter. Prescription drug therapies commonly administered via infusion include antibiotic, antifungal and antiviral medications. Infusion therapy is also offered for hydration, pain management and nutrition, as well as blood and blood products. The NorthBay infusion facility has an on-site physician and nurses with special education and training in the administration of drugs and biologics via infusion. 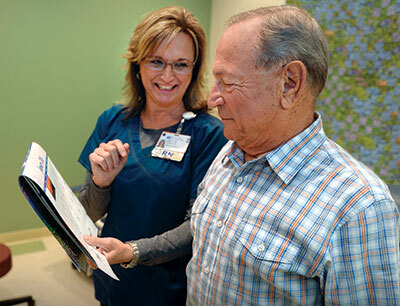 They ensure proper patient education and training and monitor the patient’s infusion sessions. Diseases commonly requiring infusion therapy include infections that are unresponsive to oral antibiotics, dehydration, gastrointestinal diseases or disorders that prevent normal functioning of the gastrointestinal system, according to infusion nurse Patti Bales, R.N. Other conditions treated with specialty infusion therapies may include congestive heart failure, Crohn’s Disease, hemophilia, anemia, immune deficiencies, multiple sclerosis, and rheumatoid arthritis. For more information, contact NorthBay Wound Care, Hyperbarics and Infusion Therapy at (707) 624-7979.